They use the balance of the book to share how to make that happen. 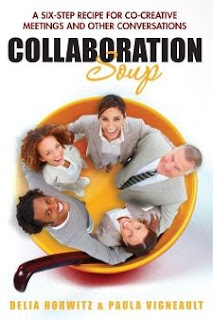 Not through either force or wishful thinking, but by taking the book’s title very much to heart and approaching collaboration with the same type of creative action one might use to make a stew. Or soup. Attitude is everything. We all know that food tastes better when made with care, so bring your good will, acceptance, and creativity with you to the collaboration kitchen.